Improve Sublime according to your requirements. 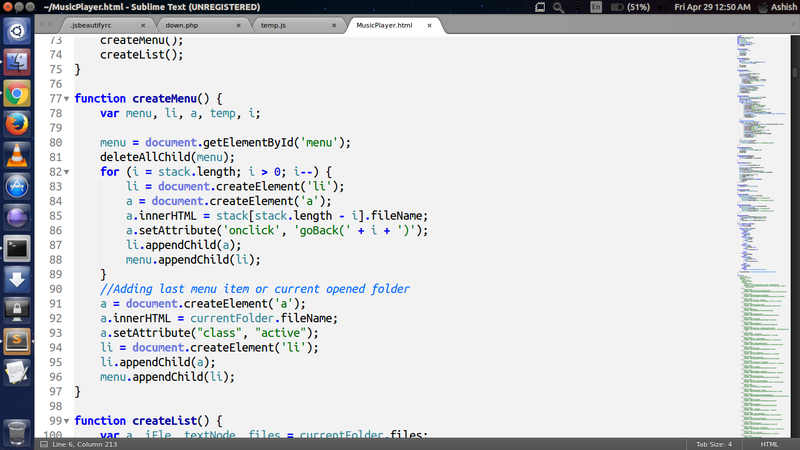 Maybe Sublime is a good text editor. But we all know that nothing is almighty. Therefor here are some recommendations that would make life easy. Open Preferences > Settings - user and put the following settings. "fade_fold_buttons": false,	//The arrows aren’t visible until you hover. After installing package manager install package HTML-CSS-JS Prettify. To install goto Preferences > Package Control. A box will be opened. Select Install Package, search preetify and install that. Preetify is used to beautify your code. // along the default ones. "space_after_anon_function": false, // Should the space before an anonymous function's parens be added, "function()" vs "function ()"
"space_before_conditional": true, // Should the space before conditional statement be added, "if(true)" vs "if (true)"
"space_in_empty_paren": false, // Add padding spaces within empty paren, "f()" vs "f( )"
"unescape_strings": false, // Should printable characters in strings encoded in \xNN notation be unescaped, "example" vs "\x65\x78\x61\x6d\x70\x6c\x65"
I have changed indent_char and indent_size. You can also use Eslint if you want. You can find more plugins in Google Developer Site.